The International Cortona week is the extension and development of the classic Cortona-week. Pier Luigi Luisi, the founder of the Cortona-week, left the direction of the meeting in 2010, in the occasion of the 25.th anniversary (the first Cortona week took place in 1985). Since then, prof. Luisi devoted his attention to the development of the International Cortona-week. The basic idea is to export the experiment to all other best academic centres of Europe, Americas, Asia, and constitute an international network of Cortona-weeks which synergy and international interactions with each other. 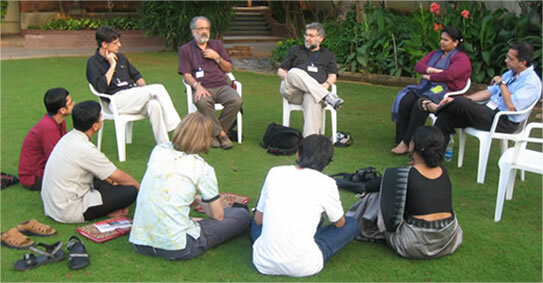 Two of these conferences have already taken place, one in Cortona in June 2009 for (mostly) American students with the financial help of the Fetzer Institute (see www.cortonaweek.it); the other, the Cortona-India, in Hyderabad in November 2010, (see www.cortona-india.org). Both conferences had the subtitle “Science and Spirituality”. This deadline conveys the information that the aim of the Cortona week is the creation of a novel generation of scientists (in all branches of natural and humanistic directions) who have acquired a more active sensibility for spiritual, ethical as well as ecological values. Spirituality does not necessarily mean religion, it is prior to religion and indicates broadly the values related to inner growth and to the implementation of ecological, ethical and social principles, and is something which is generally missing in our academic education system. And in fact, one general problem faced by several countries in the world is the lack of a leadership endowed with the proper equilibrium between an interdisciplinary scientific/technical preparation from the one hand and ethical/spiritual values from the other. The other main character –as exemplified in the Cortona-India- is to rediscover the basic cultural and spiritual traditions of the host country-be India or Brazil or China: this at the aim to promote a synergy between these ancient, original traditions and the new economic and technological world of today--traditions which are threatened of disappearance in this fast-moving world of globalization and consumerism. Participant of 15-18 different nationalities were present in Cortona India as well as in Cortona-Fetzer, contributing to the formation of the network of friendships and scientific collaborations beyond any border and language barrier. Other editions of Cortona International? A few are in preparation, (Cortona-China, Cortona-Brazil, Cortona-Italy) the main problem for the practical implementation being-not surprisingly-the financial one (each Cortona-week needs about 200,000 US $). Here, in fact, is where the help and advice of web readers is welcome. If you have ideas on this point, please contact prof. Luisi at luisi@mat.ethz.ch.